Quite interestingly, on the same day Rahul Gandhi, vice president of the Indian National Congress (INC) was in Chhattisgarh, a BJP ruled state, meeting tribal and farming communities. He went on record, assuring them that he will stand by them to protect the rights of tribal communities who were under the threat of displacement due to coal mining. This could be pure coincidence, or maybe not. But the above background is important to understand the context in which directions from the MoTA to state governments on the implementation of the FRA have been issued, further to the PM’s “campaign mode emphasis”. It is also critical to analyse why the term “settlement” of individual and community level claims is being used rather than the process of “recognition”, which is spelt out in the preambular sections of the FRA. Soon after the directions from the PM, the newly appointed secretary of the Ministry of Tribal Affairs (MoTA), followed these orders to instruct nine states to follow a “target based approach” and set time lines for the implementation of this law. Is the Forest Rights Act working? The letter dated 10 June 2015 and addressed to West Bengal, Uttarakhand, Uttar Pradesh, Kerala, Karnataka, Jharkhand, Himachal Pradesh, Bihar, and Telangana specifically instructed these states to expedite the FRA implementation and set up special cells for monitoring the law’s implementation on a “mission mode”. A road map set out for the next six months up to December 2015 included activities such as awareness-building exercises, trainings, organising Gram Sabha (village assemblies) for clarifying claims and ensuring proper Record of Rights (RoR). This letter included a caveat that, “care should be exercised to ensure that no genuine claimant is denied (of) filing claims over and above the indicated timeline”. Was this a welcome move? For all those who had been raising concerns about the lackadaisical approach of relevant institutions in processing rights claims, perhaps it was. For many others, it also raised some caution. Would the completion of the process pave the way for the land to be acquired? Was the government seriously interested in recognising rights and strengthening community-based forest governance, or was this meant to settle the record of rights so that the forest diversion processes would be less contested? These questions still remain an area of debate and unresolved to say the least. The strict monitoring of this process has continued. On 14 July 2015, the Secretary, Ministry of Tribal Welfare organised a video conference with the Principal Secretaries/Secretaries of the States of Odisha, Chhattisgarh, Andhra Pradesh, Maharashtra, Madhya Pradesh, Gujarat and Rajasthan and directed them to prepare a work plan for the effective implementation of the FRA, 2006. The same was reiterated when the FRA was reviewed as part of the Pro-Active Governance And Timely Implementation (PRAGATI) initiative launched by the Prime Minister to address the “common man’s grievances”, and simultaneously monitor and review important programmes and projects. The PRAGATI meeting added the words “time-bound” to mission and campaign mode for the implementation of the FRA. It was clear that the central government had set the clock ticking for the FRA issue to be settled in the next two-three months. Is this at the heart of the government going on a mission or campaign mode to implement FRA? On 3 August 2009, what was then called the Ministry of Environment and Forests (MoEF) issued an important circular, which, among other things, clarified that no diversion of forest land for non-forest use would take effect unless the process of recognition of rights had been completed. It also said that the consent of the Gram Sabhas would be required before the diversion process can be given effect. Over the years, there have been controversial attempts to revisit the emphasis of this circular or seek exemptions for projects that are linear in nature, especially when it comes to the consent of the Gram Sabha. But as on date, the requirement of this circular, also reiterated by MoTA, is very much in place. In May 2014, the MoEF had issued its Forest Conservation Rules, 2014 where it had specifically institutionalised the time bound process of settlement of rights by the District Collector under the FRA. The DC was given a time frame of 30 days for proposals for diversion of forest land up to 40 hectares of forestland. If the proposed diversion was between 40-100 hectares, the time before the DC was 45 days, and for over 100 hectares the time given was 60 days. This is to coincide with the time that a Divisional Forest Officer (DFO) is given to ascertain and prepare their report on whether the loss of forest towards a mine, industry, road, plantation, port, railway line etc can be justified, and if yes, with what mitigation measures. Pursuant to the video conference on 14 July, the Government of Chhattisgarh issued a controversial order on 27 July 2015 for the time bound action plan for implementation of FRA in the state. This plan, stated to be initiated from 10 August 2015, seeks to complete the process of recognition of rights (individual and community), review of rejected claims, finalisation of the Record of Rights (RoR) documentation and establishment of the mandatory committees for the management of community forest rights/community forest resource rights. All this, as well as special efforts for recognition of rights for Particularly Vulnerable Tribal Groups (PVTG), needs to be completed by 31 August 2015, as stated by the Government of Chhattisgarh’s work plan. While the overall plan was in question, one of the immediate questions raised at the state level by groups such as Chhattisgarh Bachao Andolan (CBA - Save Chhattisgarh Movement) was the push to use the annual Gram Sabhas routinely organised every year on 15 August to also take forward the time bound approach. The July 2015 circular of the Chhattisgarh government stated that these Gram Sabhas could be the forums where consent letters are procured, indicating that there are no claims pending before the Gram Sabhas. Gram Sabhas are the most crucial institutions under the FRA where claims are to be verified and then sent ahead for administrative processing. CBA’s press release dated 9 August 2015 highlights that the recognition of rights is an ongoing process and such tight time frames for implementation goes against the provisions of the FRA. Their concerns are especially valid in the light of the statistics put forward by the Government of Chhattisgarh, which indicate that as of May 2015, 59 percent of the claims forwarded to the administration have been rejected. Further, where claims have been approved, it is for a much lesser area than what has been claimed. Even as strong political (including those by the INC) objections within Chhattisgarh continued, Members of Parliament from ten political parties including CPI (M), CPI, AAP, Congress, NCP, JD(U), SP, TRS, Trinamool Congress and YSR Congress also wrote to the PM on 12 August 2015, indicating that in the “last three months several BJP-ruled state governments have been attempting to undercut the key provisions of this historic law”. One or all of the above reasons led to the MoTA issuing a letter to the Chhattisgarh government indicating that “the issue of whether vesting and recognition of forest rights is complete (should) be considered at Gram Sabha meetings specially convened for this purpose, and not be bundled with multiple other agenda items on 15th August, 2015”. The letter, while appreciating the state government’s proactive and time bound effort, states that this should not go against the spirit of the law, nor in any way bypass legal requirements. Is the proposed MOTA road map desirable? While the MoTA has issued its cautionary advice, the fact remains that both the PRAGATI initiative of the PMO and the road map of the MoTA are pushing the state governments to expedite and complete the process of recognition of rights. This suggestive road map talks about calling in for claims after undertaking activities like training programs on the FRA; awareness and mapping processes which are to be completed by September 2015. November 2015 is when the sub divisional and district level committees are to complete “final decision/ recognition and vesting of rights” while the RoR for the rights recognised and vested during this period are to be completed by December 2015. The process of recording of rights is not a simple one and has several practical complications. Discussions and mapping of community forest resources and rights are far more complex processes, which might require reconciliation of overlapping claims and inter-Gram Sabha as well as inter-departmental coordination. But a deeper question pertains to the shrouded intent that drives the current government’s current FRA mission. 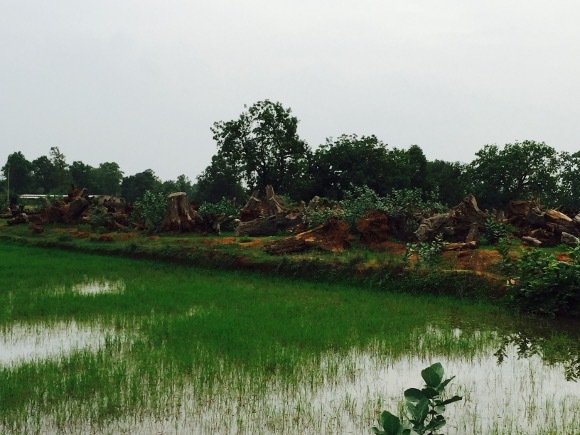 Is the government merely trying to gain credible points by backing forest rights? Or is there a need to contextualise this within the larger issues of forest diversion? Does “campaign mode”, actually aid “settling” forest claims, and what does it mean for areas where people are living over proposed mines or collecting forest produce where an industrial railway line has been demarcated? Either way, are rights holders and claimants prepared for what lies ahead?